Its Samsung, the South Korean Electronics Giant, with its next Generation of digi watches, which is rightly named as Samsung Gear and this time ” Samsung Gear S”. This is a pretty cool device, better than its predecessors with a Super AMOLED, 2 Inch Curved LED display. It has been released with the Samsung Galaxy Note 4. With Screen Resolutions of 360 X 480 pixels and 12.5 mm thick, it’s gonna make a revolution in the Digital watches segment. Weighing just 67 Grams, it has a Metal Frame and a Rubber/Plastic Wrist strap and also a metal wrist Brace. The Specialty of the device is, it’s a Standalone device running with Samsung’s own Tizen OS, with a Dual-Core 1 GHz processor and 512 MB of RAM with 4 GB of internal memory. The device is also capable of 2G/3G connectivity and thus can accept a SIM Card. And what’s Special in that?? ?… Every Company has the same. Right???.. 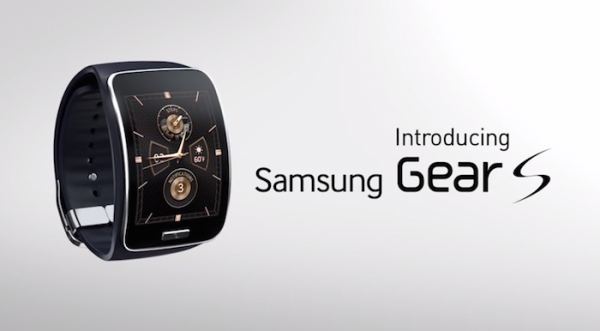 This Gear S has Samsung’s Own developed S-Health Application, which is specially designed for exercises. And also a sensor at the Bottom for Calculating Heartbeat Rate, which is a bit upgraded from its predecessors and other Digital watches. And also Water and Dust resistant not more than 3 meters Depth. S-Voice, MP3/MP4/AAC/WAV Player, Photo/Video Viewer and Voice Memos etc. add to its features. These are some Salient features, that makes this Stand a bit higher in the market and as said, it’s a Standalone device and does not require any Smartphone support, but marketed along with Samsung Galaxy Alpha and Newly released Galaxy Note 4.